A safari in Africa can be a dangerous proposition, but also a fantastic one! Out for another early morning trek scouting watering holes, I was enjoying the scenery fly by until my guide suddenly slammed on the breaks and pointed out towards a copse of trees. Focusing my lens, I began photographing what I thought were elephants in the distance. “No, look towards the grass!” my guide whispered. 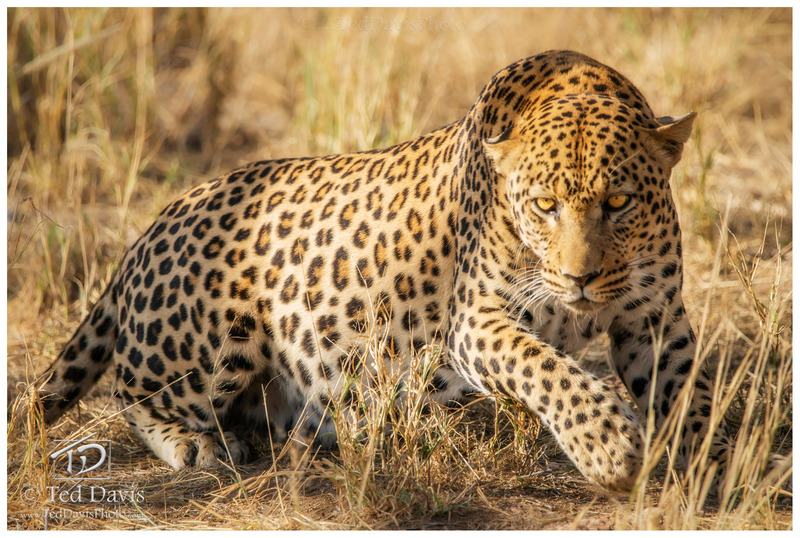 There, not 40 feet from our vehicle, was a leopard lying peacefully in the golden grass of the savanna. I was floored. With advice from my guide, I started snapping shot after shot. “They move fast, keep watching.” My eye was glued to the camera. “He sees us,” whispers my guide as the leopard turns his head and begins to rise. Snap! As the leopard began to approach to the vehicle, I realized in that moment I was sitting in an open Safari truck only feet from this awesome predator. “We must leave,” the guide whispers as he turns the engine over and we drive off, leaving the beautiful leopard to his own devices. Photo © copyright by Ted Davis.